SCIENTISTS from Yale University and the Smithsonian Institution in the United States have discovered a prehistoric flightless Jamaican bird, which used its club-like wings as weapons. Skeletons of the chicken-sized Xenicibis xympithecus were found in the Red Hills Fissure cave deposits in Saint Andrew. 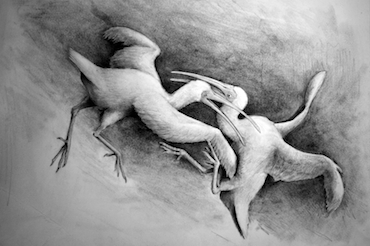 Paleontologist Nicholas Longrich believes that the bird would have swung its upper arm to strike its enemies with its unusually thick hand bones. Longrich said he was unaware of any other species that used its body as a flail. I sometimes compare these things to nunchucks, which I guess would make this a ninja bird, although perhaps a better analogy would be a pair of baseball bats — they were actively swung rather than moving passively like a flail or nunchaku," he told the Christian Science Monitor. Another unusual characteristic of the bird, according to the research, was that it became flightless despite the presence of a number of predators, including the Jamaican yellow boa, a small extinct monkey and more than a dozen birds of prey.